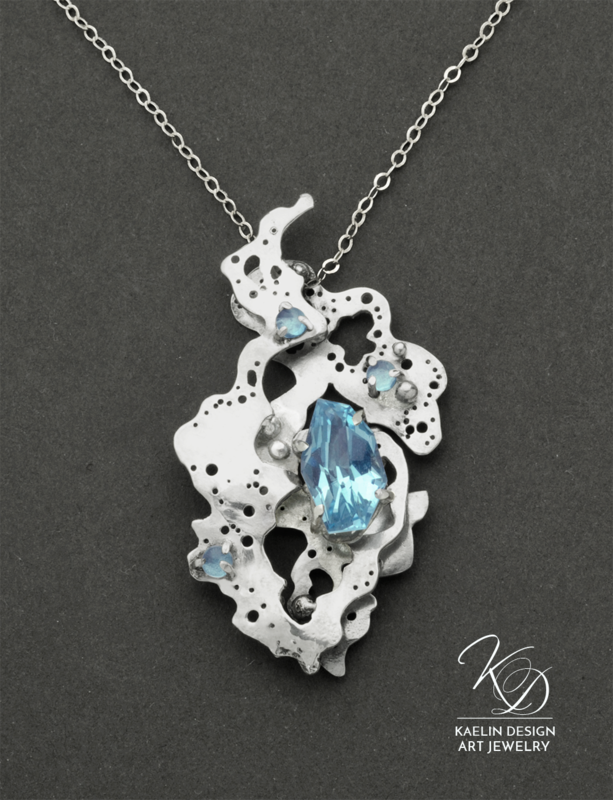 This ocean art pendant is directly inspired by the ebb and flow is sea foam along the shore. It is a myriad of sparkling mirrored bubbles- ephemeral and intermittent. Like a dozen trillion tiny worlds that exist only to delight, there and then gone. I am captivated by the ocean in all its forms. From the briny deeps to the shallowest tidepool- each face of the ocean is breathtaking and inspiring. All the world is touched in one way or another by the ocean- and yet so much of it is still undiscovered. Mysterious and overwhelming, or gently lapping on sunlit beaches... the ocean is indescribably wonderful. Sea Foam is hand fabricated in Argentium Silver, fused and formed to frame a 6.4 carat Blue Topaz, and accented by three 3mm blue Topaz mini cabochons.